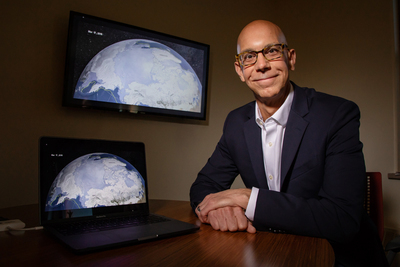 University of Illinois atmospheric sciences professor (Robert) Jeff Trapp is a co-author of a new study that has identified the possible links between global climate change, Arctic sea ice retreat and tornadoes. CHAMPAIGN, Ill. — The effects of global climate change taking place in the Arctic may influence weather much closer to home for millions of Americans, researchers report. The United States has experienced many changes in severe-weather behavior over the past decade, including fewer tornado touchdowns than in the past. A new study suggests that atmospheric circulation changes that coincide with a loss of Arctic sea ice may be partly to blame. The researchers performed statistical analyses of nearly three decades of historical weather and climate data and found significant correlations between tornado activity and the extent of Arctic sea ice – especially during the month July. “One of the reasons that we focused on sea ice is because, like the ocean and land, it is relatively slow to evolve,” Trapp said. “Because sea ice and the atmosphere are coupled, the response of the atmosphere is also relatively slow. We can use this property to help make long-term predictions for tornadoes and hail, similar to the way predictions are made for hurricane seasons.” But before doing so, Trapp said they still need to understand the drivers of the sea ice changes and what role the tropics may be playing. To reach Jeff Trapp, call 217-300-0967; jtrapp@illinois.edu. The paper “Exploring a possible connection between U.S. tornado activity and Arctic sea ice” is available online and from the U. of I. News Bureau.